BDU School of Law holds a discussion/consultative forum with concerned stakeholders on the Provisions of Free Legal Aid Service Delivery on April 13, 2019. The main aim is to assure effective free legal aid service delivery across the Free Legal Aid Centers. Department of Governance and Development Studies holds Curriculum validation workshop to launch the MA program in Governance and Development on August 25, 2017. LLM students of Business and Corporate Law at the Law School, KahalidKebede and SitelbenatHassen, havereceived the “Michael Sher Educational Award” of the 25th Willem C. Vis International Commercial Arbitration Moot Court Competition in Vienna, Austria.Khalid and Sitelbenat were awarded in front of 2000 representatives of more than 360 universities from around the globe, arbitration professionals and international academic scholars. It is the first time an Ethiopian (and even African) university receives this award. It is for the second time that the School of Law has been represented in this prestigious Moot Court Competition, and that our last year representatives have even bring further academic partnerships with Penn State University from USA, where they have also been offered a scholarship for further postgraduate studies. BDU boldly appreciates its students for winning the award and representing the university in this international forum. Congratulations! A lecturer at the Law School and editor in chief of Bahir Dar University Journal of law, Mr. Haile Gush, has participated a symposium on building a research writing culture at Shams University, Cairo, Egypt. Participants brought their journals from their own institution/country as a basis for a critical discussion about journal review criteria and journal identity. Strategies for developing research writing capacity with doctoral students and junior academics were discussed. Tools and techniques for facilitating discussions and giving and receiving peer feedback are also reviewed. The initial impetus for the programme is to address inequalities in academic publishing and participation through increasing individual participation and contribution of writers from under-represented countries in the Global South. Some of the ideas taken by the participants of this symposium are supporting young researchers, setting up a writers’ group; using the feedback frameworks presented at the symposium, organizing a research forum to provide feedback to young researchers; using guidelines for writers and reviewers; organizing workshops with local journal editors and reviewers. Senior scholars from social science departments in higher education institutions within Egypt and the region have participated. The symposium was an opportunity for participants to develop a network of resources, ideas and support to build the culture of academic writing and publishing in their institution. The programme has been run in Addis Ababa (2014), Mumbai (2015), Quezon City (2016), Kathmandu (2017) and this year in Egypt. 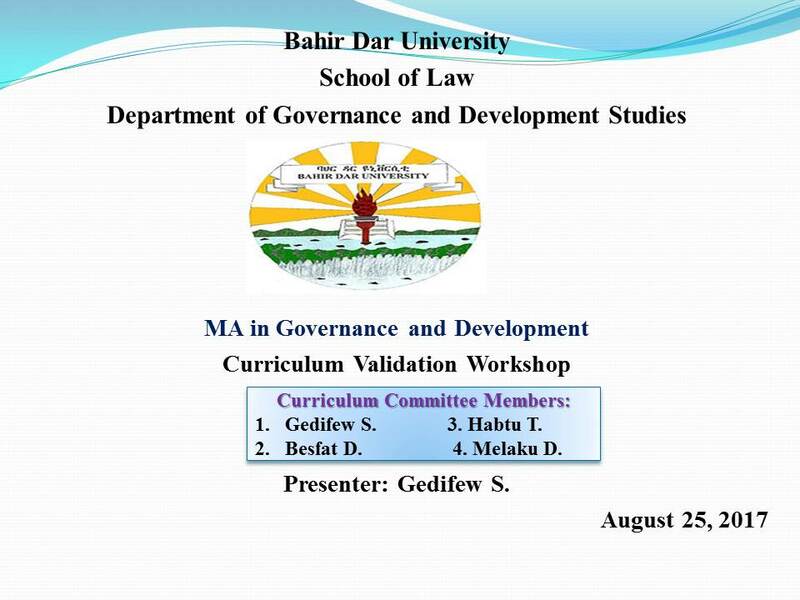 Bahir Dar University Journal of Law has been included and added into the HeinOnline Database. HeinOnline is one of the leading legal research database containing more than 150 million pages and 150,000 titles of legal history and government documents in fully searchable and image based format. HeinOnline bridges the gap in historical research by providing comprehensive coverage from inception of more than 2,400 law-related periodicals. It is currently available to researchers worldwide in more than 3,500 physical locations in over 175 countries, thus being an excellent way to expose journals to researchers worldwide. Bahir Dar University Journal of Law is a reputable and bi-annual legal periodical which has been published by the law school since May 2010. The journal is a forum for legal scholars to publish manuscripts that meet intellectual quality and contribution for the legal profession and the administration of justice in general. Bahir Dar University School of law has held May Seminar at old senate meeting hall, Peda campus. In the seminar research works conducted by the Law School staff in 2009 and the best senior thesis from graduating law students were presented. The best senior thesis by Yemisrach Belay was made to be presented at the seminar following the decision of the School Academic Council. Yemisrach has done an exemplary work by analyzing the adequacy of international humanitarian in regulating explosive weapons and ruminants of war. The School has taken this initiation to encourage and cultivate research culture of students in the School. It was taken as breakthrough and other academic units should take a lesson. In addition, the School has awarded the student. Staff members, stake holders from different institutions who have close connection with research presented, and other interested individuals have attended the event. The participants have forwarded critical and constructive feedbacks, and agreed to work in collaboration with the School to solve the problems discovered by the researches. LLM students of Business and Corporate Law, School of Law, BDU, are to represent the university in the 24th William C. Vis International Commercial Arbitration Moot Court Competition in Vienna, Austria. We will be represented by Ayene Mengesha Sisay (who is also an academic staff at the law school) and Zena Abera Tesema. The William C. Vis International Commercial Arbitration Moot Court Competition is one of the most prestigious International Commercial Arbitration Moot Competition whereby more than 340 universities around the world will take part in this year only. 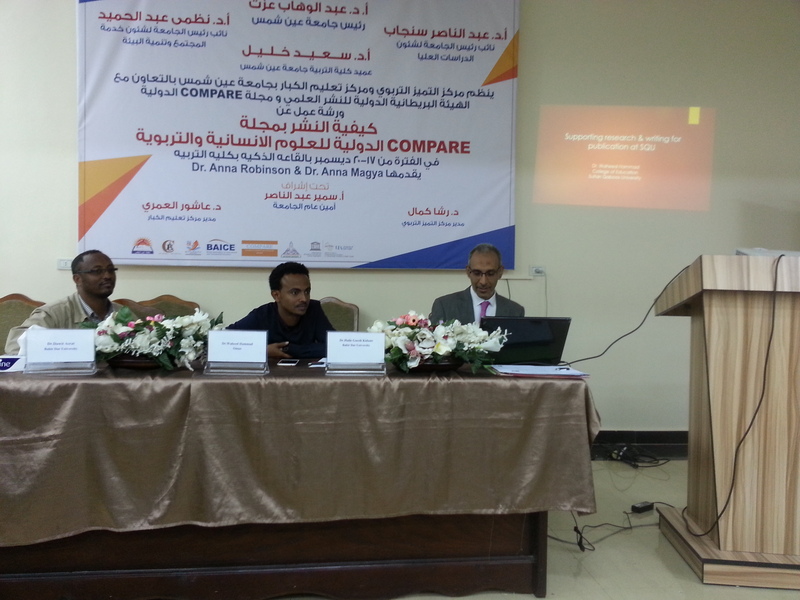 BDU and Cairo University are the only representatives from Africa in the competition. Such a global contest is the first for both BDU and Ethiopian universities in general. In the first phase, BDU’s LLM students have submitted written memorials both as an applicant and respondent, and it is after a very competitive screening of memorials submitted by different universities that our team has advance to the oral round. Before participating in the oral litigation at Vienna, Austria(from April 6 – April 13), our representatives will participate in the pre-moot event organized at Heidelberg University, Germany(from March 31 – April 5). In the preliminary round of the oral litigation, BDU representatives will be facing the representatives of Universidade de of De Brazilia (Brazil), Erasmus University (The Netherlands), New York University (USA) and ILS Law College, Pune (India). BDU wishes its students a great success. This academic engagement of BDU, through global ties and academic partnerships, is part of its vision of joining hands with institutions working towards internationalization higher education and the assurance of its quality. The forum is an informal gathering of a wide spectrum of African leaders and citizens: heads of state and government, leaders of regional organizations, civil society and the private sector, eminent scholars and practitioners, students and youth, and representatives of Africa's global partners. Forum participants are drawn from across the continent and overseas. Pressing security threats and, over time, cultivate a distinctively African voice on understanding and confronting the chief peace and security challenges the continent is facing. Tana Forum Secretariat announced “2016 Tana Forum Universities’ Essay Competition” under the aforementioned theme. The Competition is intended to be part of this consultative debate that is envisioned to contribute to policy building and development. Around 17 Tana Forum Universities are invited to participate in the essay competition being represented by their masters or PhD Students. 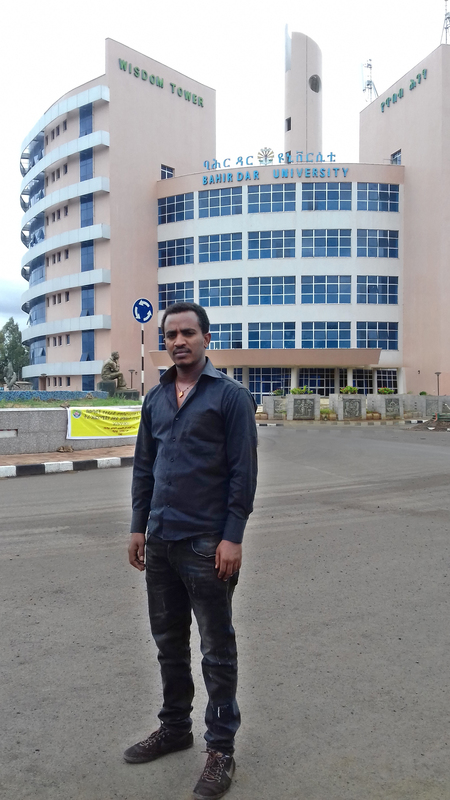 Accordingly, Bahir Dar University is represented by Mesfin Beyene, LLM candidate of Bahir Dar University School of Law. 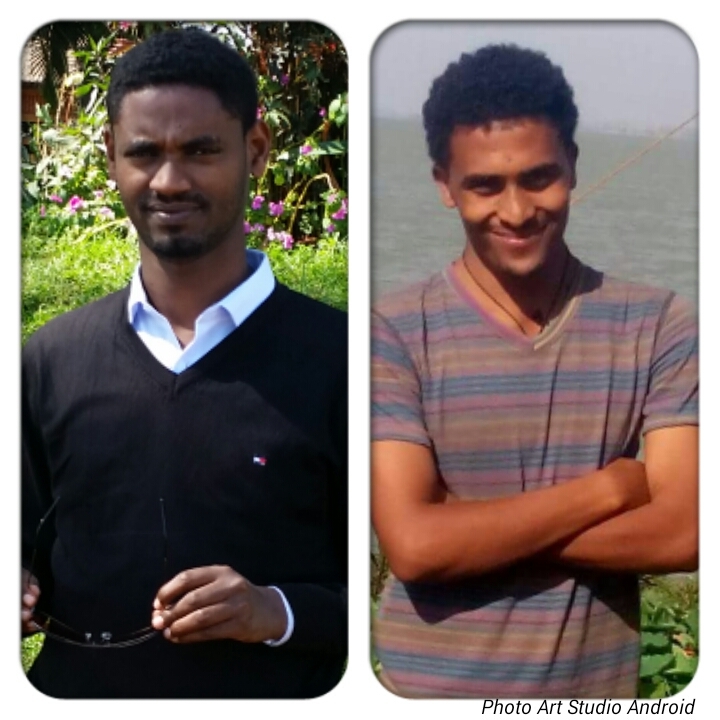 Mesfin’s essay is ranked second next to a student of Nairobi University who is a PhD candidate. 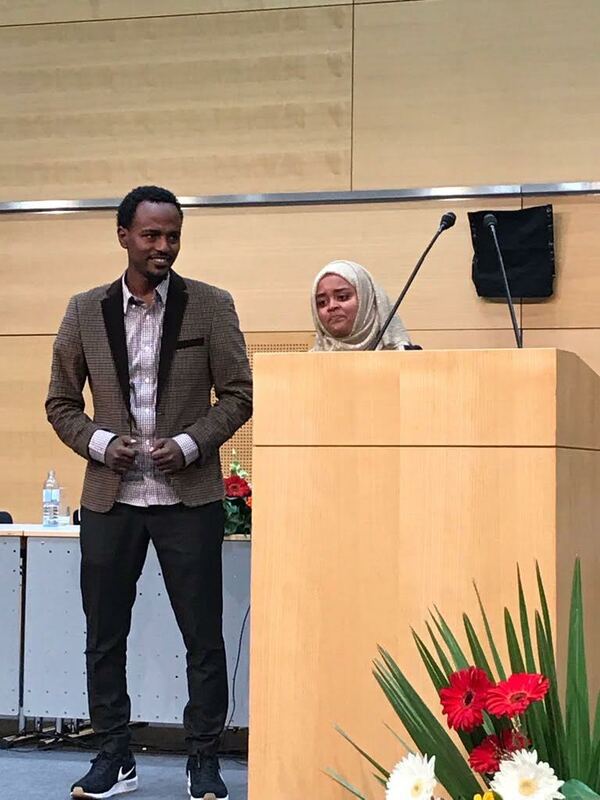 Asked to reflect his feeling, Mesfin stated that “Even though it was pain-staking task and responsibility to me to compete with top-ranked continental universities represented mostly by PhD students, finally I did it.” He also acknowledged Law School Administration and academic staff for assistance he received during the competition. The school of Law boldly appreciates Mesfin Beyene for winning the competition and representing BDU and BDU School of Law in particular before continental forum. Congratulations! The School also congratulates the entire Bahir Dar University Community for the recorded success. Finally, we call upon our students to participate in research and community service goals the school wishes to attain.